How much does Broadview Entertainment Arts University ask for tuition now, and how much are they going to ask for in the future? How does tuition rival other colleges? Read on to find out. Get a full knowledge of the fees and tuition related to Broadview Entertainment Arts University so that you can plan effectively for 4-6 years. Look at the numbers below to learn how Broadview Entertainment Arts University's price stacks up to other schools and if you need to arrange for tuition increases. How do Fees & Tuition at Broadview Entertainment Arts University Compare to Other Colleges? For nationwide, regional and statewide comparisons, check out the table below to find out how Broadview Entertainment Arts University compares to other colleges. In the 2017 - 2018 school year, regular students at Broadview Entertainment Arts University were billed $14,850, prior to modifications for financial need. From this total, the price tag on tuition was $13,650. $1,200 was the charge for fees. Alas, this college doesn't offer any tuition discounts to in-state students. Broadview Entertainment Arts University fees and tuition is the sum quoted to undergrads for one year of attendance, not including room and board. Note many students have financial aid and scholarships that decrease their total cost. The subsequent table shows the expenses defined above for the 2017 - 2018 academic year. How much does Broadview Entertainment Arts University cost part time? For more info, check out Broadview Entertainment Arts University Part Time Tuition & Fees. There continues to be a growth of 4.9% in Broadview Entertainment Arts University fees and tuition for out-of-state students in the past five years. Tuition grew by 0.6% and fees grew by N/A. This school year, undergraduates can anticipate paying $15,578 based on current estimates. Due to price growth, the total expense of a four-year degree would be $67,042, and the total price of a two-year degree would be $31,919, which doesn't include extra expenses such as books, transportation, and room and board. 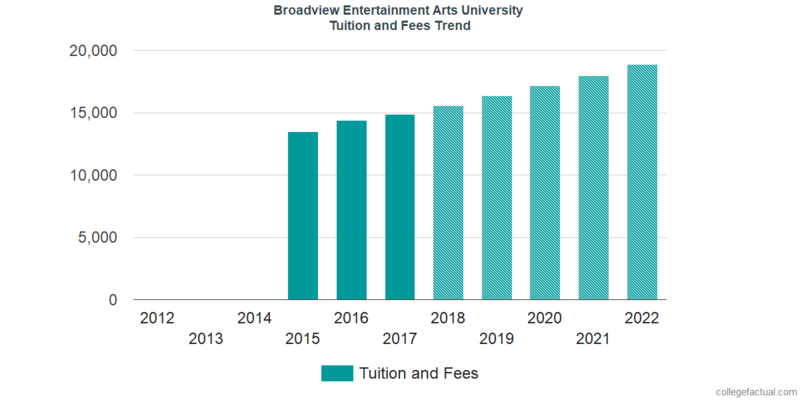 The next chart displays projected future fees and tuition for undergraduates at Broadview Entertainment Arts University. At most colleges you'll wind up paying out more in your final year of school than you will in your first. This is due to yearly cost growth. It's good to be in the know!